At age 14 he starts painting graffiti, influenced by the initial boom of Hip Hop culture in Spain. One year later, he meets Henry Chalfant in Barcelona through D.F.R. Crew and Kiku Mistu. That meeting with Henry Chalfant, author of the film Stylewars and the books Subway Art and Spray Can Art, was both enriching and the beginning of a deep friendship. Through Henry, Fasim gets to know and understand the wildstyle graffiti that was blossoming in the New York subway and promptly introduces this style in Spain. His pioneering in the wildstyle made him a well known artist and a source of inspiration for a new generation of graffiti artists. Leading a live that could be described as that of a modern-era Huckleberry Finn, he painted trains and walls almost on a daily basis. In several trips to Paris, he gets acquaintanced with Jonone and the BBCrew and joins their group “156 all stars”. Among many others, he has painted along with Sento, Seen, Pjay, Dare, Jay, Echo, Jonone, Sharp, Sen2, Macrew, T-kid, Cope, Ink, Loomit, Toast, Inka, Kane, Won abc, and Popay. 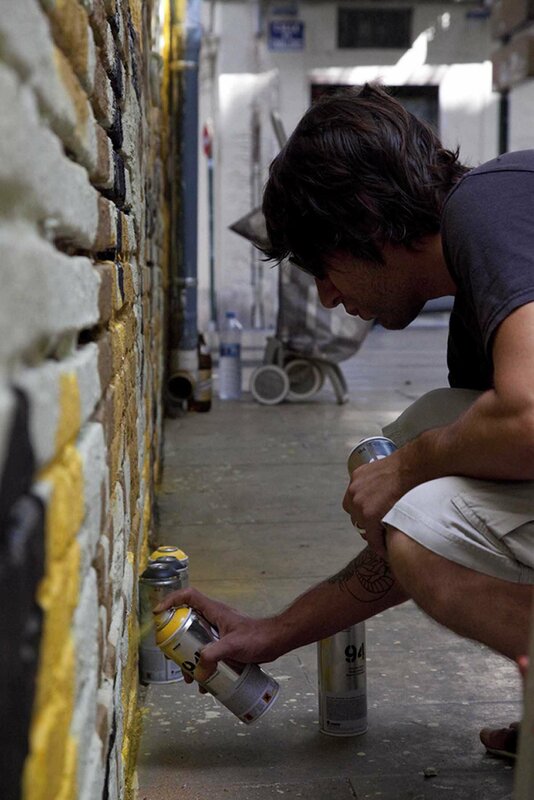 At just 21 years old, he was already well known in the international graffiti scene, and he had brought into Spain a brand-new, fully developed urban art form. Driven by his endless curiosity, at that moment he started combining graffiti with other currents in painting. For years, he visits art museums and art galleries and learns about modern and contemporary vanguards, which were to influence his artwork. He also became a tireless reader about arts, literature and poetry. Slowly and tenaciously he then decides to set himself apart from his previous influences and develop an artistic language of his own, such a style that he would define himself as “a painter of human catacombs”. In 1996, four years after the end of the war, he travels to Sarajevo. This travel would forever change his vision of the world, as he gets deeply impressed by the genocide. For some days he shares a house with a number of war survivors. In a journey of no return from the horrors committed there, he rescues children’s drawings from ruined schools and makes a massive collage painting with them. This marked the start of a brave adventure of commitment. His painting turns rebellious, anarchic and lucid, where color becomes a killer of the world’s pernicious morality. Dramatic monochromes and a raw expressiveness were to become two of the main features in his work. His vigorous, audacious and unpredictable paintings leave no one indifferent. Fasim paintings show a frank depiction of the world’s virtues and disasters, where everything melts into a supreme expression close to weeping, to insanity, to the joy of life and to laughter, despite all. Classical and contemporary at the same time, this brutal painter can’t be pigeonholed: for years he has been painting from his soul, and not from commercial strategies. The only influence that he admits having nowadays is that of Francisco de Goya. 2003 Junio, París;“Expo Kosmopolite”, Taxi Gallery, colectiva junto a Loomit, T-Kid, Cope2, PornoStars, Ink76, Sonic Bad, Ket, Sixe, Lokiss, Popay, MACrew. Pintura sobre lienzo. 2004 Julio, Barcelona, Iguapop Gallery; “39 artistas del graffiti sobre lienzo” y “Art is not a crime” exposición conjunta con Henry Chalfant. Pintura sobre lienzo y fotografia. 2006 Barcelona, Niu Gallery , “Pintures Salvatges des de La Makabra”, colectiva junto a Blobs y Morgan (WildHeadz). Pintura sobre lienzo. 2007 Octubre, Barcelona, Niu Gallery; “The jacket battle”, colectiva. Mixed media. 2009 Sevilla, Montana Gallery, “Raíces”, colectiva junto a Logan, Suso 33 y Rosh. 2010 Bilbao, SC Gallery, “ReVelión”, Individual. Pintura sobre lienzo. 2010 Julio, Valencia, Pl. Del Tossal; “ Stop victims war wall”, pintura mural en directo durante 15 días. Realización del video con el mismo nombre junto a Jordi Ferrer y Diana Puertas y música de Dive Dibosso. 2010 Noviembre, Barcelona, Mtn Gallery; “Art transit”, colectiva. Pintura sobre maquetas de vagones del metro de New York. 2011 Barcelona, “Exit 10 años dejando huella”, Museo de Arte Contemporáneo de Barcelona (Macba), colectiva. 2011 Abril, Barcelona, Mtn Gallery; “I was here!”, individual. Pintura sobre lienzo. 2011 Bilbao, exposición colectiva, “Subculture II”. Selección de artistas de la galería. Sc Gallery Bilbao. 2012, Barcelona, Niu Gallery; “Blobs & Fasim, Crónicas de Pueblo Nuevo”. Dibujos sobre papel. Colectiva. 2012, Barcelona,TheGallery Pro, Hotel Barceló Raval; “Keith Haring Memorándum”. Dibujos sobre papel. Colectiva. 2012, Barcelona, MTN Gallery, “Homenaje a Moebius”, 30 artistas internacionales rinden tributo a Moebius. Pintura. Colectiva. 2012, Elche/Valencia, BlackLab22, “Straight From The Undergroung”. Colectiva. 2013, Elche, Blacklab 22; “Ephemeral mural”. 2014, Barcelona, Imaginart* Gallery, “MED street art”. Colectiva.